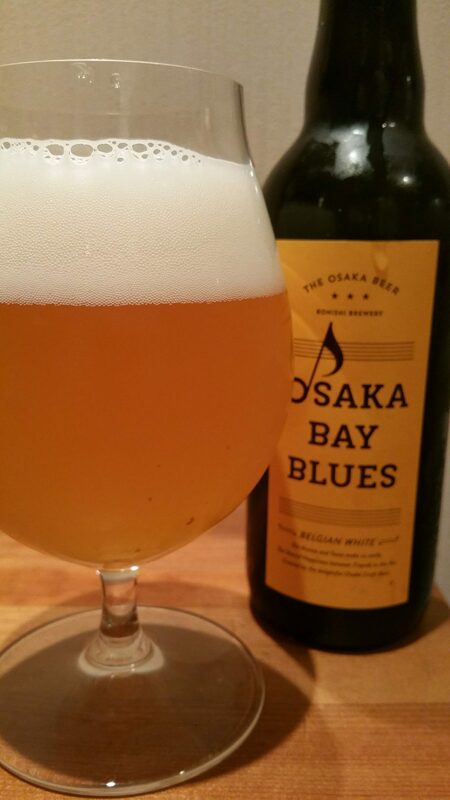 Osaka Bay Blues is a 5% witbier from Konishi Brewing, based in Hyogo, Japan. It’s brewed as part of their regular limited edition line-up, though there doesn’t seem to be any restriction on it. Osaka Bay Blues is brewed with orange and coriander and can be found across Japan in bottles, though we’ve heard that it will see a draft release at some point in 2017. Some random joke about “play it again, Sam”. Osaka Bay Blues poured out a hazy golden colour with a fairly voluminous head that was fluffy and white. It lasted for quite a while too, before collapsing in on itself. The beer had a wheat orange aroma with a slight spicy coriander nose to it – more than other witbiers I’ve drunk in the past. It wasn’t offensive when chilled though when it had warmed up, it was more noticeable. The beer itself, despite the large amount of head, wasn’t as carbonated as I thought it was going to be in the end. The orange and coriander paired off well with the wheat biscuit flavour to it. However, when Osaka Bay Blues had warmed up, it was a tad on the sweet side for my liking, and not as crisp or refreshing as when it was chilled. It finished off with a slight bitter edge to it, that felt more astringent than I would have liked. Osaka Bay Blues is your run-of-the-mill witbier – nothing special about it and not worth the price. If you can find it cheap, then pick one up, else give it a miss.